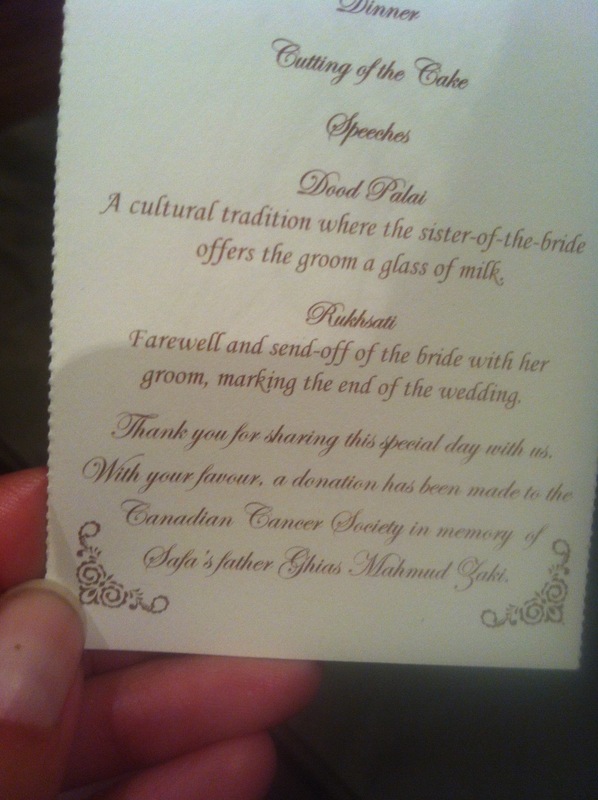 Throughout my wedding planning process I attended a few South Asian wedding shows (Suhaag, Kismet), but I never really got anything out of them except learning about one thing: the Canadian Cancer Society’s In Lieu of Wedding Favour Donation program. When I saw a Canadian Cancer Society booth at the Suhaag show last year, I stopped to find out why they were there. 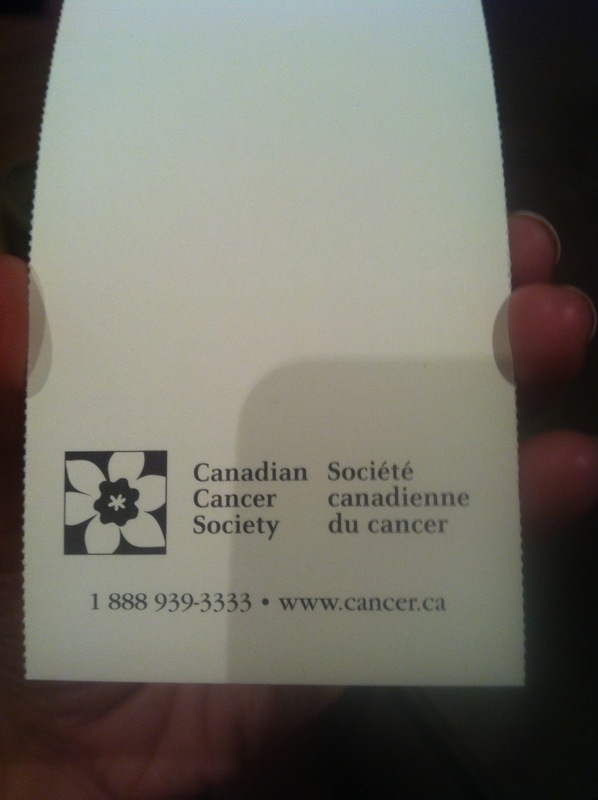 It turns out the Cancer Society has a wedding Favour donation program where instead of giving your guests traditional favors, you make a donation to the society and they provide you with embossed cards or bookmarks which you can personalize for your guests, so you’re essentially making a donation on their behalf. I instantly loved the idea. I’ve always thought favours are pretty useless and a cost that’s just not worth it, with the exception of extremely practical, usable favors that don’t have the couple’s names written on them in a permanent fashion. Otherwise, people always just end up throwing favors out (because why would you want to display an engraved decorative object with a couples name that’s not your own in your home?!). I can’t remember a wedding Favour I’ve ever saved, and so the idea of donating the money I would have spent on something that probably would have just ended up in the trash was a no brainer! Also, the Canadian Cancer Society resonated with me because my dad passed away from Cancer when I was 13, and so it felt like the perfect way to bring him into the wedding. 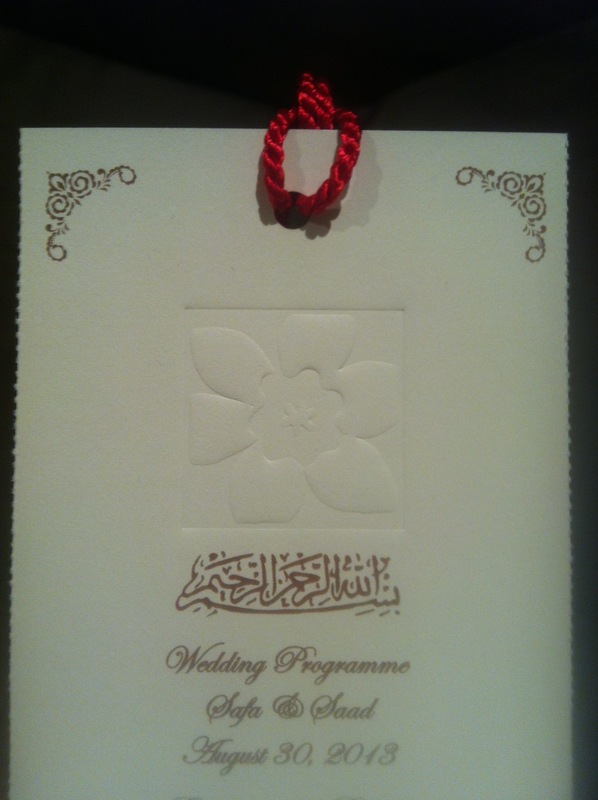 I also felt that weddings get so expensive and exorbitant in themselves (especially desi weddings!) that this was a nice way to give back. 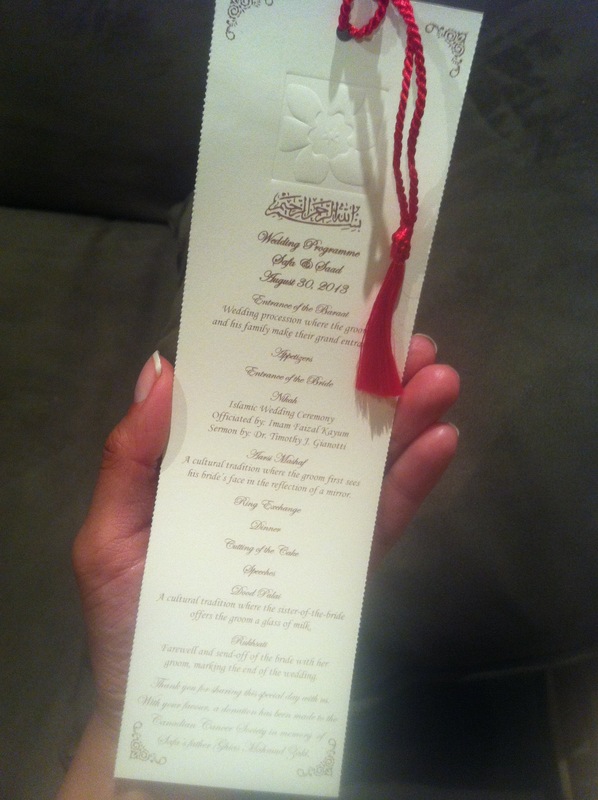 The way the program works is that you go onto their website for wedding donations and you can choose either blank bookmarks ($2) and cards ($3.50) which they will send you once you donate the amount – which would equal the cost of the bookmark/card times the number of guests you have. I donated $640 and they sent me 320 bookmarks (blank perforated pages and string – from which you can choose certain colors) and then I had them printed myself. I decided that seeing as I wanted to have a wedding programme to give guests an idea of the sequence of events, instead of printing them separately, I would just have the programme printed on the bookmark itself, with the dedication at the end: “With your Favour a donation has been made to the Canadian Cancer Society in honor of Safa’s father, Ghias Mahmud Zaki.” I was quite happy with myself about this idea – cost savings and environmentally friendly! I had them printed at a little Indian print shop called SL Graphics, 1246 Bloor Street West, and the guy their did a great job, even putting up with me for an hour in his store as I went over exactly what I wanted lol, (I love mom and pop shops, I felt right at home) and charged me $60 for printing 81 pages, which is a great deal. I’m fairly certain that other charities also have such a program – it’s definitely a worthwhile alternative for traditional wedding favors in my opinion!